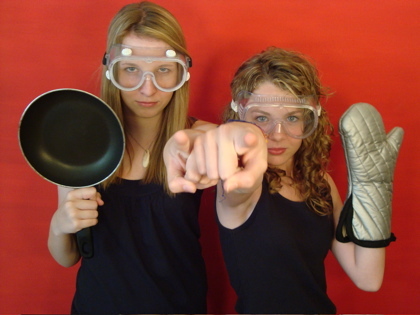 Crunch into a bowl of sweet, salty Kettle Corn with Lauren & Gillian! 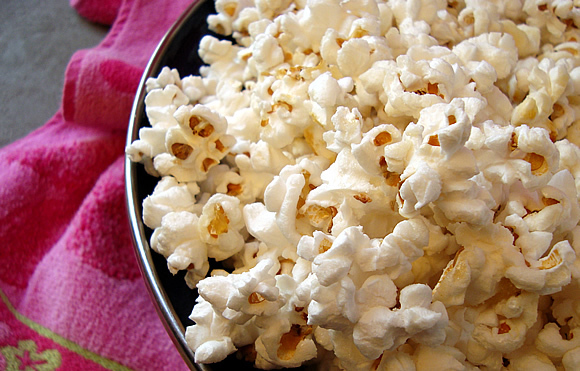 Kettle Popcorn just may be the perfect summertime snack… ADULT SUPERVISION RECOMMENDED! NOTES: A heavy, four quart saucepan is the perfect size for this recipe. 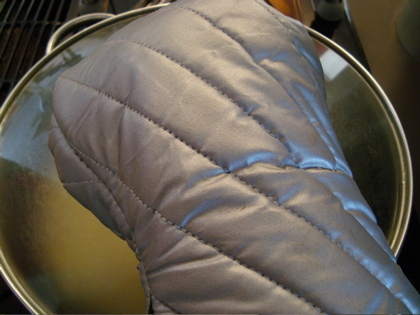 Oven Mitts will protect your flesh. Wear them. You’ll thank me later. Safety First! Hot oil and popping projectiles, not to mention a lot of vigorous shaking of kitchen equipment can make for dangerous conditions in the kitchen! 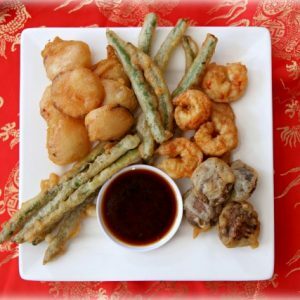 You may consider suiting up just to eat this stuff! Alright. Not really. But be sure to watch the video, Popcorn Stars! 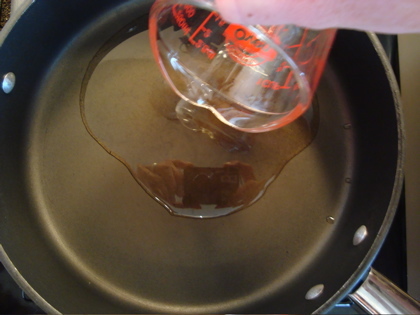 Pour oil in saucepan, cover with lid and heat over medium-high heat for 3-4 minutes. Oil should be heated, but not smoking. See the reflection of the camera in the oil? This makes me feel like the M. C. Escher of Kettle Corn. 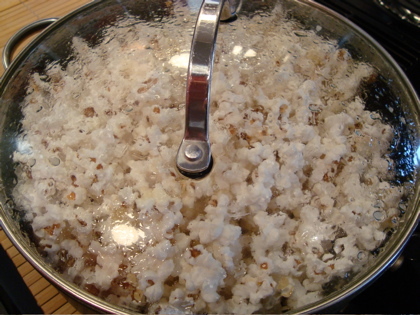 Remove lid and pour popcorn kernels into the pan all at once. Pour in sugar all at once. 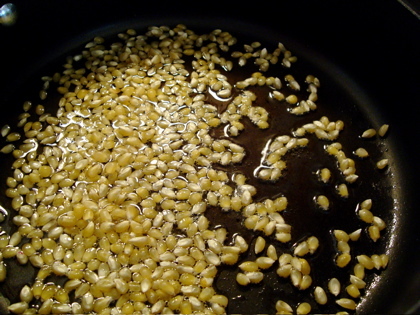 Stir the kernels and sugar into the oil. 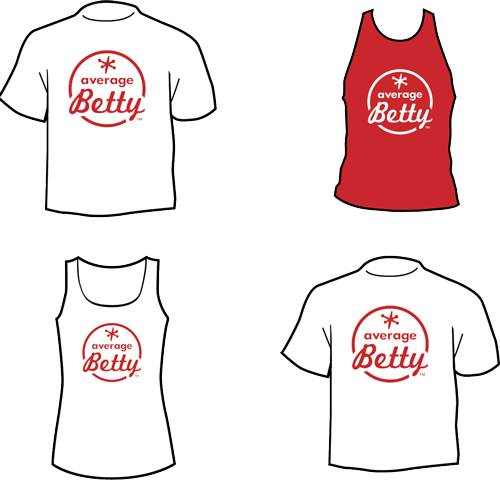 This allows for more even distribution of the sugar. Work quickly; kernels may begin popping at any time. Replace lid and begin shaking pan in a circular motion. Continuous shaking ensures that the sugar will not burn, stick or clump. This is quite an arm workout, btw. 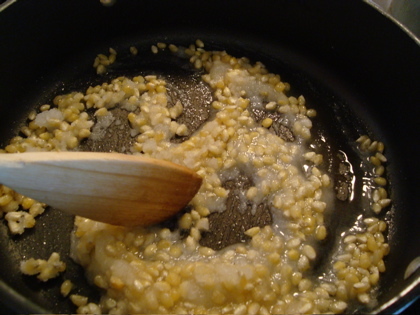 After 4 – 5 minutes, when popping has stopped, you will have a pan full of popped, hot, scorching, sticky, burn-inducing Kettle Corn. And possibly a sore arm. 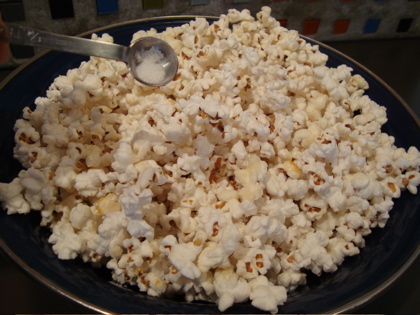 Carefully… like with oven mitts on… pour the hot, sticky Kettle Popcorn into a bowl. You will notice some un-popped kernels. Get over it. I wonder if it has something to do with the sugar that there seems to be more “Old Maids” in Kettle Corn than regular Popcorn. 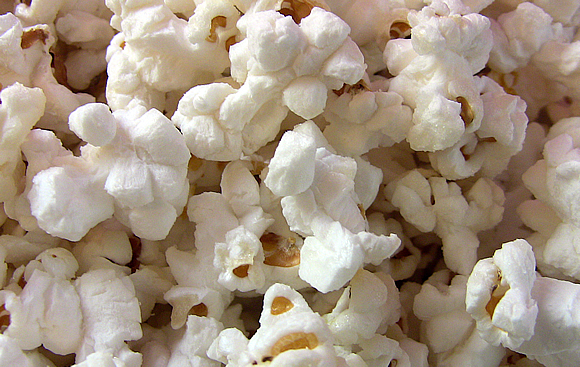 If you fret about popping every kernel, you’ll ultimately burn the batch… and that really is a tragedy. 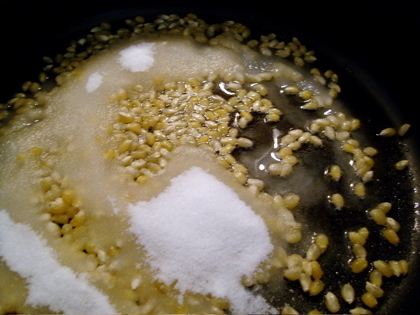 Salt to taste, 1/4 – 1/2 teaspoon. The salt really helps bring out the sweet and makes it taste just like the stuff you get at the fair. 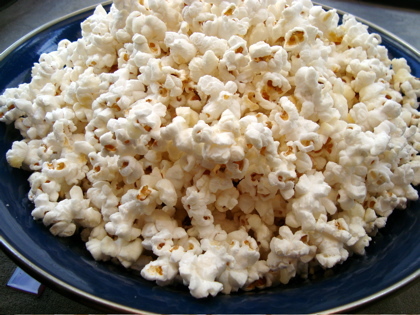 If not better :) Store or transport cooled Kettle Corn in an airtight bag or container. Link to the Popcorn Stars video. Nah, show me the sweet stuff! They are savory – not sweet. Does this help? i am thanky you becaouse you are awsome!!!!!!!!!!!!!!!!!!!!!!!!! i halft to go by!!!!!!!!!!!!!!!!!!!!!!!!!!!!!!!!!!!!!!!!!! Thanks, brooklyn! Have a fun day… Bye! Oh great recipe to make popcorn… how necessary are the goggles for the pop jumpers LOL!! As a popcorn addict, I greatly enjoyed this! Looks good! Hugging the Coast! Thank you!! I’ve never been too much of a regular popcorn fan, but this stuff is pretty addicting! 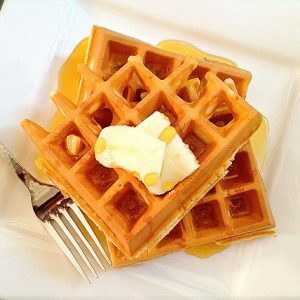 So glad you tried the recipe and you and your friends liked it! Thanks so much for dropping by to let us know!! I am jealous. I cannot do this….for as much as I have tried I have burned myself and the popcorn every time! It is one of the most vigorous recipes I know of. Sorry to hear it’s not working out for you… They do make these things called Whirley Pops that make it a lot easier, probably $25-30. If it makes you feel any better, I got a whopper of a blister on my finger from a hot, sugary popped corn landing on it! Will this work in a popcorn machine, like the ones we see at the show only on a much smaller scale? It has a electricly heated pot. a motor that stirs the popcorn. We use it at fund raisers at the school and all the time at home. I’m thinking it should work. yes! finally a recipe I can do at home for Kettle Corn. This might actually rival the kind from the fair! Not only is the kettle corn hot;so are the young ladies. I got a Whirly Pop at a yard sale for $2 ;unused! hahaha! I took the Amtrak from NY to Lancaster, PA the other day to visit my brother who lives in York. While I was on the train I had my trusty iPod and I watched your latest video podcast and was cracking up. I loved it. Can’t wait for the next one. Can I make this kettle corn in my commercial popcorn maker? I own a video store and we offer free popcorn–would like to provide this on special occasions! I’ve never tried it, but someone emailed saying they had used some sort of commercial maker for a church picnic with good results — but I have no idea what type of “commercial popcorn maker” they have. I don’t want to be responsible for ruining your popcorn maker, so I don’t know!! If you do try it, please share your results! Thank you!! This looks so delicious! 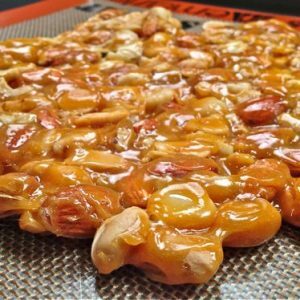 I know what I am going to be doing tonight, testing out this awesome recipe! The picture of the girls looks is adorable.